I have been receiving this little bundle of goodness through my letter box for the last 6 months now and the idea behind is great. 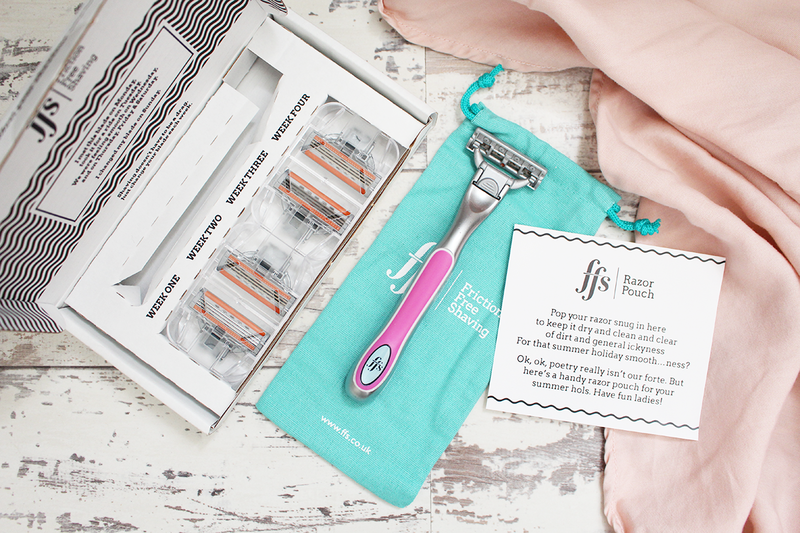 If you haven't heard of Friction Free Shaving then you need to head over to their website now. 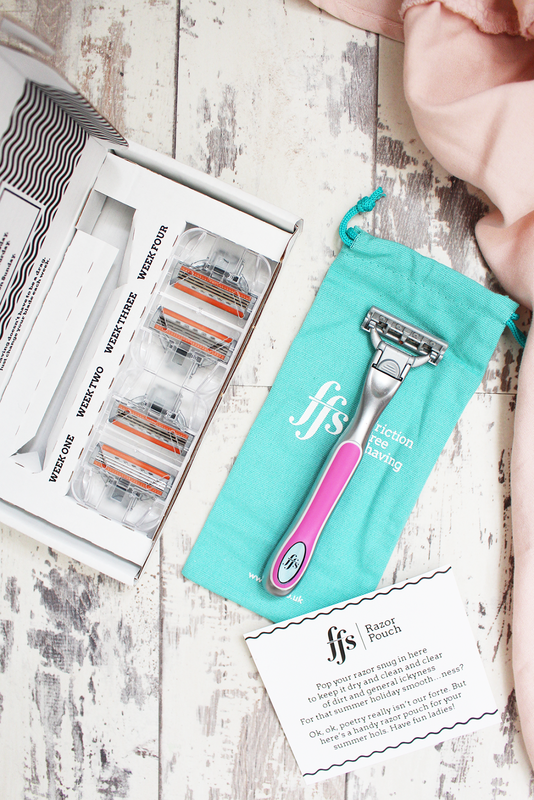 FFS are the first monthly subscription box to offer a box of 4 razor blades for you change once a week from £3.00 a month! Now we are overpaying for razors us ladies, and it is such a shame that we get taxed so much on something that many of us do use. 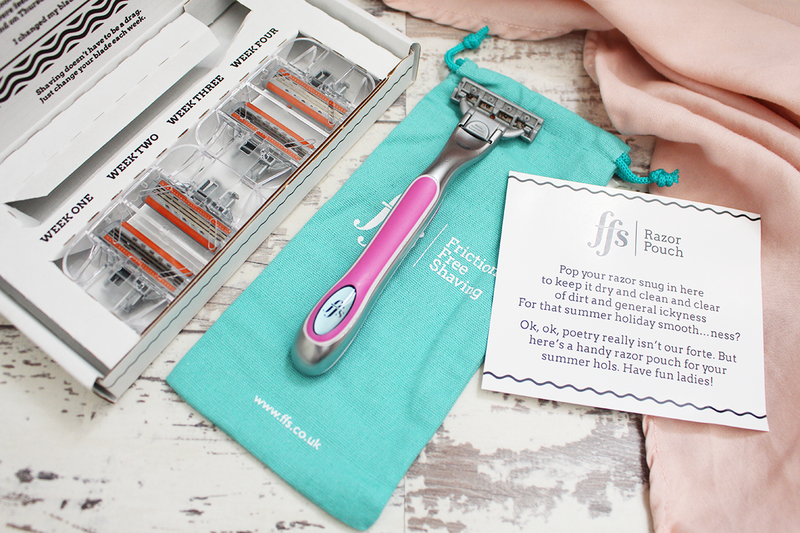 So when I heard about 4 razors being delivered to my door from just £3.00 a month I couldn't quite believe it! But it is indeed true and there are 3 razors to choose from, I chose the Frankie razor purely because it is pink - typical me. This is £5.00 a month and for your first box you receive the razor and the 4 blades, and each following month you will receive the 4 blades. There is also a razor called Faye which is £3.00 a month which has 2 blade heads. Finally Samantha, which is a really stunning gold colour which is also available in blue with 5 head blades for £7.00 a month. However if you don't feel like you need this every month there is an option for every other month so they have really thought it through! So you can say goodbye to friction legs, as with this little gem you no longer have to keep overusing the same blade because it costs so much! This is well and truly a fantastic idea and as for the quality of these razors and the blades - remarkable. I have had my razor for 6 months and I use it everyday and there is not a single sign of wear and tear or even a spot of rust! You can sign up and purchase your razor here so enjoy!